On Saturday night, I dug through a box of old photos trying to find a picture of my mom and me. I knew that posting a picture of the two of us on Facebook for Mother’s Day was a bit cliche, but I also knew my mom would like it if I did. It was a nice way to send a little extra love to Wisconsin, where my mom was spending the day with my sister. Considering that my childhood took place before the dawn of the camera phone, or the digital camera for that matter, I have an amazing amount of pictures from when I was young. Not quite the 4,000 of my kids that sit on my iPhone at any given time, waiting to be shared on Instagram or deleted or – HA! – printed, but a lot. The photos aren’t just the big events – birthdays and Christmas and graduations – but also day-to-day moments. 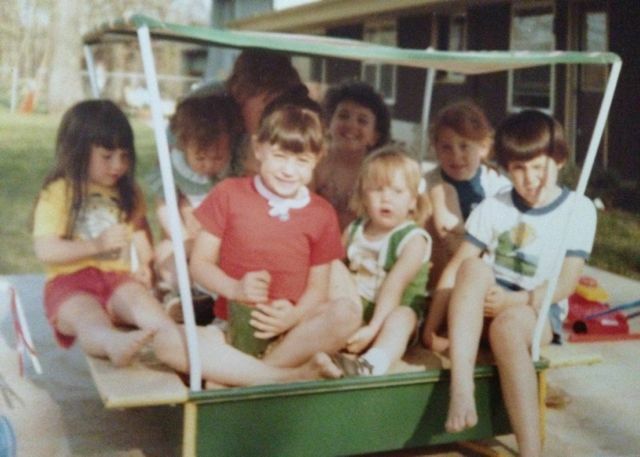 Pictures of my friends and me on our bikes, or in the sandbox, or playing dress-up. Pictures of me in the crib with my sister. Pictures of my dad holding me in front of his new car. Yes, compared to pictures of my kids, they are grainy and oddly tinted (it’s hard to tell in some of the earlier ones if my hair was blonde or strawberry blonde). But what they lack in quality, the make up for in quantity. I managed to find one of us in a baby pool on the driveway of the house we lived in for my first year, before we moved to the house next door. 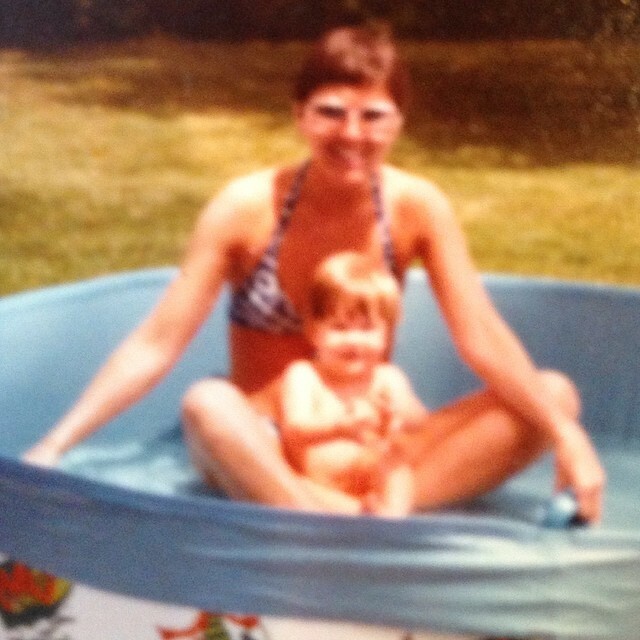 “June 1979, Amy’s 1st pool” my mom had written on the back. “She loved the pool!” I’m guessing she had mailed it to my grandma in North Dakota, back before we could send our parents daily dispatches via email, text and FaceTime chats. There were a couple others of us together. But it struck me that in most of the photographs, in the album after album documenting my childhood, my mother was absent. She was the woman behind the camera. The woman directing eight 5-year-olds at a birthday party to smile. The woman arranging the presents and cards from that birthday around the cake and snapping a shot for posterity. The woman propping me on the living room coffee table for a picture in every new dress I wore. The woman taking pictures as I squirmed in the arms of relatives or proudly displayed my new Cabbage Patch Kid or tried to hula hoop. 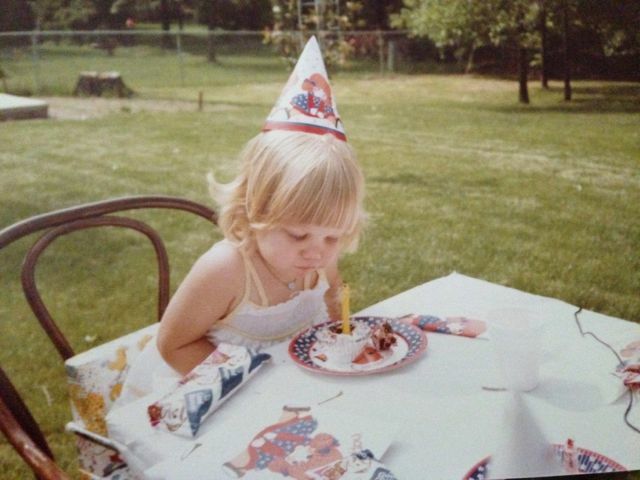 She was the woman taking pictures of the backyard decorated for a birthday party, with streamers and balloons lolling from tree branches over the paper-draped picnic table. 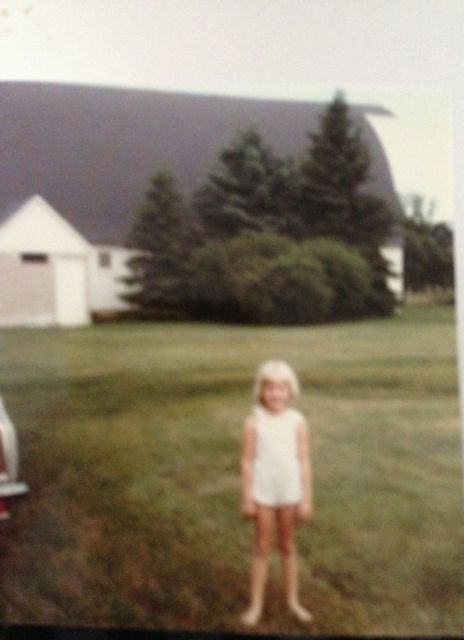 Pictures in the gravel driveway of my grandparent’s farm, the white barn in the background. Pictures of painted faces and tea parties and Halloween costumes and ballet recitals and the first day of school. And while it doesn’t look like my mom is in many of the pictures, the truth is that she’s in all of them. Not just because she’s the one orchestrating the shot. But because she’s the one creating the moment. The one picking out the dress and carefully curling my hair. The one driving us ten hours each way to visit our North Dakota relatives at least twice a year. The one signing me up for lessons in ballet and gymnastics and horseback riding and piano, and driving me to those lessons each week. The one planning those birthday parties and picking out special presents. Yes, my dad was part of all of this, too. Compared to many other dads of his generation, he was incredibly involved in the lives of my sister and me, from big events to small. Because he was something of an anomaly, it is easy to hold him up as a Superdad. 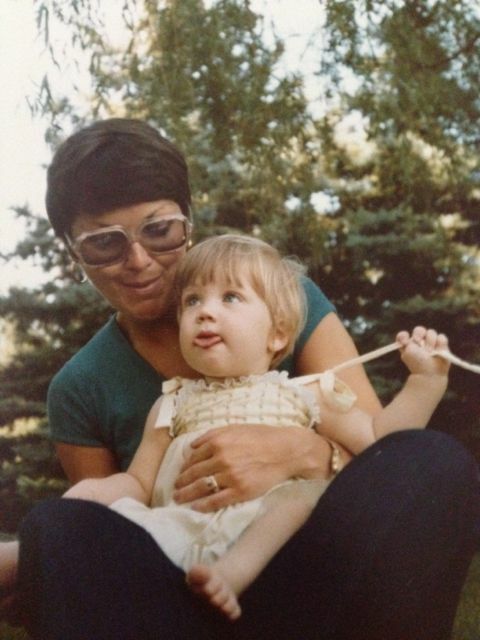 Many of my mom’s contributions, on the other hand, are easy to take for granted. Not just all the “special” moments captured in photographs, but the everyday things. She worked as a high school English teacher, pouring her heart into her “kids,” as she called her students. Then she came home and put dinner on the table every night. She spent her Saturday mornings scrubbing the kitchen floor, doing our laundry, and teaching us how to vacuum and dust. The behind-the-scenes work that is never glamorous and rarely acknowledged, but has to be done. So while I did eventually find a picture of us to put on Facebook, I don’t know that it adequately told the story of my mom’s involvement in all the other moments in my life, both monumental and mundane. And so today, even though I’m a bit late in saying it, thank you, Mom. I love this Amy! Have you read the blog by Allison Tate Slater – “mom Says In the Picture?” Google it (it was on Huff Po), it’s fantastic! Thanks, Allie! Yes, “The Mom Stays in the Picture” was really meaningful to me. I had a newborn when it came out, and definitely could identify with not wanting to be photographed! I actually reread it right after I published this, because I had this sudden fear that I had subconsciously plagiarized. : ) But I was reminded it’s a while different angle on a similar topic! Thank you! And isn’t that the truth? Love this, Amy. Made me tear up on the EL on the way to work- but love the perspective both in thinking about my mom and in being a mom. Thanks, Sadie! I was thinking about you and your sisters on Mother’s Day when I saw photos of your mom. I know she did all these things and more!